The following information has been provided by Suresh, coordinator of TSS (Tamakoshi Sewa Samiti) to explain how the Nepal Earthquake Relief money sent by WNC will be used. In his proposal, Suresh provides details about the distribution process as well as describing the emotional effects of the earthquake. A few excerpts have been highlighted, along with a couple of pictures; the entire proposal is also available at the end of this article. The devastating earthquake of 25th April, 2015 with the magnitude of 7.9 and next day’s big aftershock destroyed the huge number human being, government & private houses and several historical monuments. This was recorded as the second biggest earthquake in Nepal since the last 82 years. According to Home Ministry of Nepal, the number of confirmed dead reached to 8,045 and 17,866 were injured by May 11, 2015. In terms of death toll, the earthquake has affected 31 districts of Nepal. The highest number of death is recorded in Sidhupalchwok with 3,107 followed by 1,222 people in Kathmandu as the result of 25th April devastating earthquake. Unexpectedly, the powerful aftershock or second big earthaquake, with the magnitude of 7.3, occurred after 17th days on May 12, 2015. This has further aggravated the death toll, damages of houses and displacement of more families. 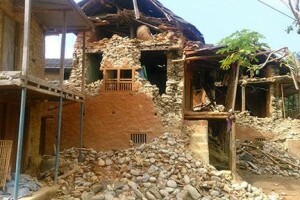 The death toll from 12th May quake has reached 117, while the number of of injuries has reached 2,760. According to the government report, the highest death is recored in Dolakha district with 40 persons. More people are still missing in all massively earthquake hit areas. The death toll from the 25 April devastating earthquake which was followed by several aftershocks including the powerful one on 12 May has reached to 8,604, as per the update report of Ministry of Home, Nepal. According to Home Ministry, a total of 499,579 buildings were hit due to the first day’s powerful quakes, 2nd day’s day big aftershock and 18th day’s even more big aftershock. Out of this number, the earthquake has fully destroyed 488,789 public houses and 10,790 government office building. Likewise, 254,112 public houses and 14,997 government buildings were suffered with some kind of partial damages. The Home Ministry has claimed 14 districts as the most vulnerable among 31 affected districts on the basis of death of people, complete destruction of houses, partial damages of houses and displacement of families. Ramechhap is the 11th most vulnerable district of the earthquake as described by the government. In Ramechhap, that lies under Central Development Region, has the total population of 202,646 with over 44,000 households. The number of death is recorded 27 in Ramechhap district as the consequence of devastating earthquake dated 12th May and second day’s aftershock. The 12th May second big earthquake has resulted additional number of death of 12 people in Ramechhap. Also, there has been more full destruction of house which were partially damaged before. Previously non-damaged houses were suffered with some of kind damages later. As per the report of District Disaster Relief Committee (DDRC) Ramechhap, 18,693 (40.68%) public & government houses were completely destroyed whereas 22,271 (48.46%) houses were partially damaged. This report was based on the field data collection as the result of 25th April earthquake. It report collection was just completed, the another 12th May earthquake occurred. The DDRC Ramechhap has now declared that 90% houses have been damaged (fully & partially) in Ramechhap and reported to central government accordingly. As per the census 2011, there are over 42,000 mud bonded brick/stone houses in Ramechhap. The overall scenario of the earthquake proved that the massive destruction & damages was related to mud bonded houses all over the country. Due to the statement made by Geo-scientist about no more another big quake, people were somehow slowly relaxing. People were normally going back to home. However, the second big earthquake has shocked the people, which was not expected within very short time. As the result of 26th May powerful earthquake, the District Disaster Relief Committee (DDRC) was formed headed by the Chief District Officer, who is the administrative chief of the district. The other members of the DDRC are chief/representative from security forces, political parties, district development committee & district health office etc. Initially, the DDRC had decided to distribute all relief support to the victims through one-way system. As per this decision the DDRC collected and stored physical support provided by many individual and organizations. Afterwards the DDRC distributed to the victims on the basis of priority. In the beginning, it was greatly needed of tent/tarpaulin for temporary shelter for the displaced families. The first priority of the government was also to supply and distribute the tents. Other interested organizations also provided tent support to DDRC. As the immediate need, TSS also provided 50 sets of tent/tarpaulin to DDRC, out of the immediate support from World Neighbour Canada. Due to pressure & voices from many organizations, the central government had to change its previous decision of one-way system. The later decision was that any individual and organization can distribute relief support to anywhere and any particular community as per their own wish. However, the prior approval should be taken from the DDRC with the type of support and name of community where it will be distributed. In Ramechhap, a number of individual and organizations are now involved in relief distribution. They are more focused on one or few particular communities. No any single person or organization can provide relief support equally to all the victims at the same time. Other than the government, the individual & organizational support are more going towards surrounding villages of Manthali due to accessiblity of motorable road and short distance. Comparatively, the victims of remote villages are less benefitted from the relief support. People are now suffering with post-traumatic terror. Due to the possibility of another great earthquake, people are again staying in open space under the temporary tents. Due to such terror, we are also treating general patients and the victims in open compound of our hospital building. However, there has not been any big damage on our hospital building. About 90% families are displaced from their houses due to complete destruction and partial damages of houses. They are all now staying in the tent as temporary shelter which will go longer until they will have some kind of permanent shelter. The effort of local government, individual & organizations has not reached to all the victim families in providing the tarpaulin sheet for their shelter. However, the families who have not received any tent support, they have somehow managed for temporary shelter by themselves. The tent/tarpaulin is not required only for the people shelter, it also required for the shelter of their livestock & food storage. Considering the fast-approaching the monsoon, the cabinet has endorsed a short-term relief package for earthquake victims primarily focusing on temporary shelter. The cabinet has decided that the families who have lost their houses due to the earthquake will get Rs. 15,000 to build temporary shelter before rainy season. This grant is for the purchase of galvanized corrugated sheets and other materials required to build shelters. The grant amount is provided on the basis of identity card issued by local government authorities. Despite the above relief support from the government, the many victims families have very difficult situation to build the permanent houses due to poor economic condition. There is another problem of food insecurity in Ramechhap. 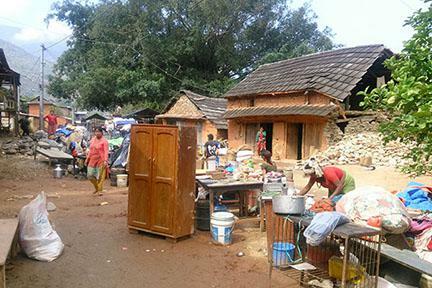 The earthquake has hit the families before the start of the main paddy growing season. The quack struck when farmers were preparing for corn and wheat harvest and paddy plantation that begins from the end of May. It is also expected of another natural disaster (flood & landslide) in coming monsoon, as many public houses have been badly hit by two big earthquakes. There is also great possibility of outbreak due to damages of houses, open cleaning, washing & defecation. Many domestic toilets have been also damaged due to two powerful earthquakes. As almost 90% (about 40,000) houses were badly hit by two big earthquake, the same number of families are affected. Out of this hit-houses, about 50% are fully destroyed and the rest 50% have damages/cracks which is not considered for habitation. Due to poor condition of families, many families will face difficulties for making permanet houses. Due to displacement and loss of income sources, they also face difficulty in food supply for their livelihood. It will be not possible to provide relief support to all victim families of Ramechhap, as it needed huge money even for a small support for all. Therefore, TSS is planning to provide support on the basis of economic condition of particular community and nature of damages. TSS wants to support those families who are economically poor & socially drowntodden. Under this criteria, it is also assessed that who have less access of relief support, full destruction of houses and severe damages of houses. The basic relief support required for the victims are mainly the tarpaulin sheet for shelter and rice for eating. On the basis of above criteria, TSS will provide its relief support in two ways – (1) the tarpaulin to those families who still greaty need it and (2) a set of food stuff (rice 30 kg pack) per family. Such kind of support will not be enough for the victims. However, we can share our helping hands. TSS will directly distribute the relief support to the selected victim families. Due to the limited funding resources, TSS is expected relief fund from World Neighbours Canada for the following activities. If more fund is received, we can support more victim families.